These are wonderful….I love how such totally different pieces of fabric go together to make a beautiful piece of wearable art! Beautiful aprons!! I love all the fabrics! So sweet that the aprons of old are now new again! Such beautiful fabrics, Suzy! How cute are those. The bottom middle one is adorable.!!! You have outdone yourself! fabulous! They are all so beautiful and fun! The colors are vibrant and full of life. Awesome new blog banner, Suzy. I love the aprons, too. Lovely! Hello I came across you today and just wanted to say I love your designs and especially the fact that you live in VA, that’s where I am originally from. 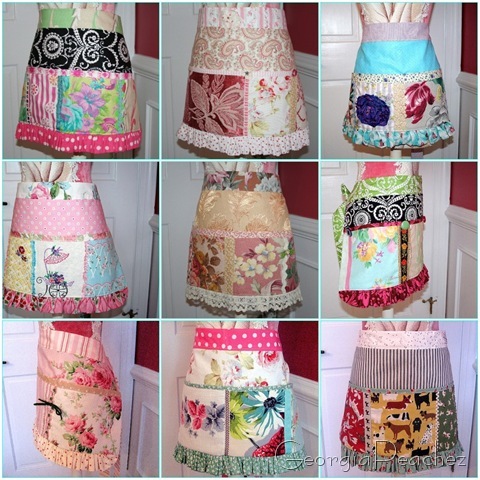 These aprons are fabulous!! I love the style with the wide band and flat front. No extra bulk around the middle…..if you get my drift. ;o) Love ’em!! For someone who is as crazy as I am about aprons, you would think I would make more of them. But no, I just drool every time I see others, especially as colorful as these. They are gorgeous.